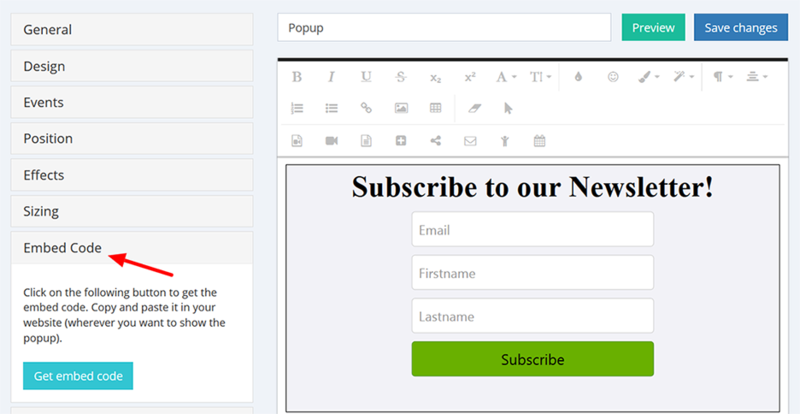 After you have created your popup, you need to attach it to the website where you wish to display it. In your Dashboard choose the popup you need, click on the option "Embed code". Or, you can get your popup&apos;s embed code right from your popup&apos;s options. Click Embed code=> Get embed code and the code will be copied - ready to be used in your site! Now that the embed code is copied, you can paste it in your website&apos;s HTML. Note: Do not touch any element inside the code. Now, you can see the popup in your website.